Kaspersky® Mobile Security 8.0 solves those problems that you’d rather not deal with. You can have complete confidence knowing that your smartphone and its contents have the same level of security as your PC. It’s packed with the richest range of features found in any smartphone security solution, protecting against loss and theft while safeguarding your privacy from prying eyes and cybercriminals. Kaspersky® Mobile Security prevents user data from falling into the wrong hands, regardless of whether a smartphone is lost or stolen. SMS-Block: If your smartphone is lost or stolen, you can prevent your personal data from falling into the wrong hands by blocking the smartphone remotely. Simply send an SMS with a predefined code word to the lost device. To unblock the smartphone, a password that only you know needs to be entered. SMS-Find: You can locate your phone using SMS Find. Just send an SMS with a password to the lost device and you will receive a link to Google Maps (as soon as a GPS connection is established)* with the exact coordinates. Once you know the whereabouts of your phone, it should be clear if it was stolen or just left somewhere. SMS-Clean: If it's clear that your smartphone has been stolen and there's no chance of getting it back, you can send an SMS with a predefined code to delete all the data stored on the device. SIM Watch: If someone removes the SIM from your smartphone, the device is automatically blocked and if a new SIM is inserted, SIM Watch will immediately send you a message with the phone's new number. Select a folder where encrypted files will be stored. Kaspersky® Mobile Security will only provide access after a user-defined password is entered. The files will remain encrypted even if someone removes the memory card from the smartphone and tries to access its contents on a PC. Kaspersky® Mobile Security can function in whitelist mode (only accepting calls and messages from specified contacts) or in blacklist mode (accepting calls and messages from all numbers except those in the list). After receiving an unwanted call or SMS, the offending number can be added to a blacklist at the touch of a button. Unwanted words or phrases can also be added to a blacklist to ensure that specific types of messages are blocked. When installed on a child's phone, Kaspersky® Mobile Security can block calls or SMSs to undesired numbers (including premium rate numbers). 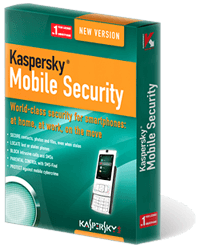 The antivirus component of Kaspersky® Mobile Security controls file activity in real time and can perform antivirus scans of the whole device on demand or on schedule. The antivirus databases are updated automatically via any accessible Internet connection or during synchronization with a PC. The product's built-in firewall also analyses network connections and closes potential security risks. There are three levels of protection to choose from: low, recommended or maximum. You can clarify which operating system is used on your smartphone by viewing Kaspersky Lab list of supported devices at www.kaspersky.com/mobile_downloads.